Sometimes when there are a lot of monarchs around Cape May Point we'll find areas where many are clustered close together in an overnight roost. This evening Michael O'Brien found a roost of about 1500 monarchs along Cambridge in Cape May Point. All signs point toward there being lots of monarchs around Cape May on Monday, but the butterflies do fool us sometimes, so nothing is guaranteed. 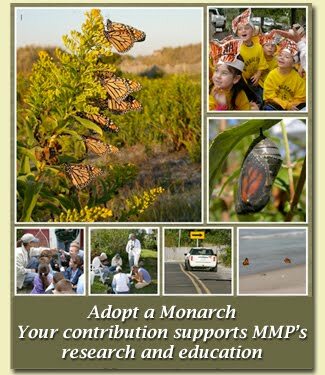 Still, if you're near Cape May tomorrow, come visit the gardens at Cape May Point and you're likely to see lots of monarchs.